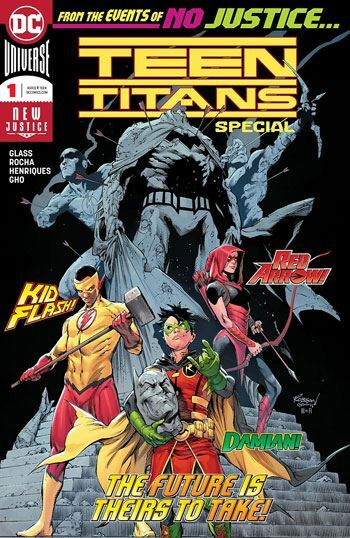 While the Titans Special rebooted that team more or less along the standard Titans lines, the Teen Titans Special has a very different feel, right from the start. Good ole Damian Wayne, who has become my favourite Robin, is back to his nasty, violent ways in this book, and is determined to put together a group of equally dangerous and disenchanted young heroes. The story is told in four distinct parts. Robin taking on Black Mask, Emiko, now Red Arrow, having a very disturbing confrontation with her mother, Shado, and Kid Flash dealing with Harley Quinn and El Diablo on a Suicide Squad mission, and being forced to step back by the other Wally West. While Damian and Emiko were both raised to be far more deadly than their current costumed hero status allows, Wally has always been pretty solidly on the nice guy side, so he is an interesting addition to what looks to be a fairly dark title. I also find it curious, but interesting, that it will be the Teen Titans, rather than the grown Titans, who will have the heavier looking series. The final page features a few new heroes, who I do not believe have been seen before, including what looks to be a young Lobo-girl. The issue is well written, and contrasts so strongly with the Titans Special that preceded it. I am glad they were released in this order, as it makes this volume stand out all the more. But as with the Titans Special, this introduction to the new creative team and direction for the Teen Titans has excited me about the upcoming series. And after all, that is exactly what it was intended to do.